I’ve never bought any cryptocurrencies, and I understand and agree with your view on cryptocurrencies like bitcoin. Am I correct in my interpretation of your theories to believe that the ideal scenario is a world reserve currency that is not attached to any single nation? Is this even possible? Even though the flaws in cryptocurrencies are readily apparent, I still can’t help but find the idea fascinating. 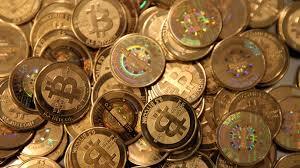 I’m wondering what your views on a TRULY anonymous digital currency would be. I’ve recently been studying “darkcoin” which has the unique ability to completely obfuscate the transactions themselves so that they can’t be traced back to an individual. As far as I know this is the only cryptocurrency that has the potential for truly anonymous transactions and transaction history built into it. From the perspective of anyone who feels they’re being taxed to death this represents inherent value, something no other digital currency has. If bitcoin gets out of control then all the government has to do is trace the transactions and persecute the individuals, but with darkcoin they would be forced to take drastic measures like using an internet kill-switch. If darkcoin were to become as popular as bitcoin, would it not force the hand of government and therefore reveal their true intentions? Could cryptocurrencies serve as light to shine on the emperor’s lack of clothes, and maybe even prove to the public that there is a need for a decentralized world currency? ANSWER: A one world currency seems to be the only POLITICAL solution. No single country’s currency can really be the reserve for what happens is clear right now. The US lowered it rates to fight the banking crisis and that began a contagion externally. Whatever the US might do with respect to monetary policy for its own economy cannot be isolated purely for domestic use. Hence, QE1-3 produced no domestic inflation because the deflation was global and the money was absorbed externally. If the dollar was not the reserve currency, then that policy would have produced inflation as the Austrian School taught. That principle does not apply to empires whose currency is used externally. The entire problem with cryptocurrencies is the fact that government has always profited from creating money known as Seigniorage (“right of the lord (seigneur) to mint money”). Illustrated here is a British protest note. The king passed a law that anyone passing a counterfeit note was to be sentenced to death. Innocent people were being hanged for simply possessing such a note. They were duped themselves and it cost them their lives. 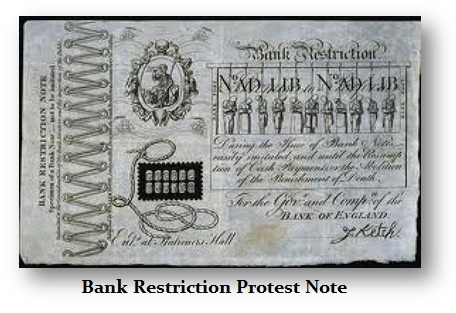 This note protested the sentencing of people for possessing such a note rather than those who produced the counterfeits. I find it hard to believe that government will allow private currency in any fashion. They lose taxes and profit. Seigniorage has always been the privilege of the lord since 600BC. I remain skeptical about government accepting private currencies based solely upon history. Governments will turn against them most likely after 2015.75 when they become really desperate for cash.